Active collaboration is employed by Enerco at all stages of projects to ensure local issues and concerns are recognized and that local communities benefit from the development of our projects. Extensive community consultation is carried out to ensure that Enerco projects bring many benefits to local people and businesses and we are proud of the positive relationship we enjoy with the public as a result. Direct and indirect local employment, Enerco actively seek to create local employment uring all our projects through direct employment by Enerco and indirect through the use of local suppliers and manufacturers where possible. Following construction a number of jobs will be required for operation and maintenance. Improved local infrastructure, Local road networks and other associated infrastructure related to the windfarm construction will be upgraded on a site specific policy. 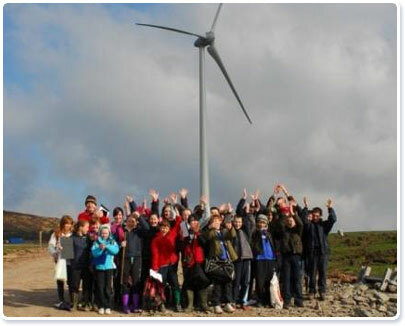 Education, Enerco is committed to supporting educational initiatives that increase awareness about renewable energy and the environment and that develop skills and knowledge of future generations. Sponsorship, Enerco has sponsored a number of local projects both sporting and cultural.